England look set to be without Tom Croft for the rest of the Six Nations and also face an anxious wait over Brad Barritt after he picked up an injury while on Saracens duty at the weekend. England face Scotland on Saturday and reports suggested Barritt was in line to step into Luther Burrell's shoes if the Northampton centre fails to recover from a calf injury this week. 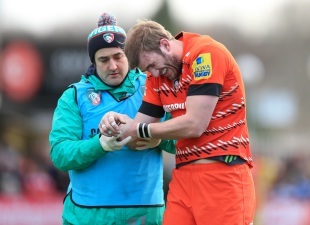 But those plans might be on ice after he limped off in Saracens' 26-17 win over Wasps on Sunday. "It seems to be his ankle, his knee seems to be okay," said Saracens boss Mark McCall post-match. "We are all hopeful that it won't be too serious. It didn't look very good. "Brad has been so unlucky this season and I am sure he would have been very close to selection for England next weekend. Fingers crossed it is not as bad as it looked." Croft has featured on the bench in England's first three matches of the championship but he suffered a suspended dislocated shoulder in Leicester's win at Newcastle. If that prognosis is confirmed, he will miss the rest of the Six Nations. England will also monitor tight-head Henry Thomas this week. He was forced off after just 16 minutes in Bath's win over Sale with a shoulder injury.